Most IT professionals today face a lack of visibility into how their IT resources are being used. Disparate, silo-based tools create gaps in infrastructure coverage and data collection, resulting in a limited understanding of resource utilization and creating difficulties for collaboration and decision-making. Does this sound like your organization? Watch guest speaker, Forrester Consulting’s Jon Erickson and ASG Technologies’ Gary Henderson discuss how ASG-TMON Performance Analyzer can provide you with the insights needed to accurately track and optimize resource use, control costs, improve service availability and effectively predict and plan with a single, consistent enterprise solution for analysis and reporting. 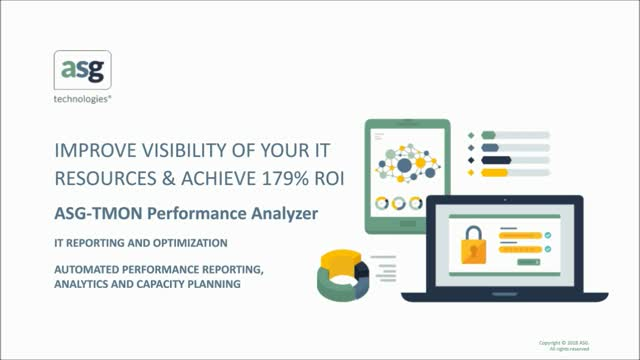 An independent Total Economic Impact™ (TEI) commissioned study conducted by Forrester Consulting on behalf of ASG Technologies revealed that ASG-TMON Performance Analyzer delivers 179% ROI, Net Present Value (NPV) of $1.5M over three years, and savings of $54K in OPEX and $180K in CAPEX. Don’t miss your opportunity to find out more. Metadata is more relevant than ever. It continues to be a powerful enabler for high-value data-driven business activities across operations, analytics and compliance. However, to maintain the relevance, metadata management must deal with the increasing complexity of today’s business use cases and hybrid data environments. Metadata management is notoriously manual which makes it slow in development and error-prone in maintenance. MDM needs better tool automation. MDM is typically siloed due to users managing metadata per tool or platform. MDM needs a unified solution that is suited to sharing, reuse, governance and comprehensive views of distributed data. Are you struggling to keep up with new regulatory and corporate policies? The new wave of consumer privacy regulations and the explosive growth of unstructured data are challenging organizations to rethink how they define, implement, adhere to and track their content governance practices. Traditional approaches—often manually executed tactics—are siloed, expensive, inconsistent, and not scalable. A fresh approach is required when it comes to governing these large volumes of content and wide array of data types that are spread across disparate systems. Technology serves business and people. Business serves people - not technology. Having a perfectly tuned mainframe, server, virtual, or cloud technology stack won’t provide your business with value – only the ability to leverage the technology to focus on business outcomes will add that insight. As Gartner wrote in its Insights from the 2018 CIO Agenda Report, “The CIO role is changing from IT-outcome-focused to business-outcome-focused." Does your enterprise support this view? In this session, find out what you should be looking for from software products and the vendors supplying them to ensure you can focus on mission critical processes, and less on the underlying technology. Are you over-provisioning server capacity, experiencing unplanned capital expenditures or just lacking the necessary capacity planning information to help you make critical decisions? If you answered “YES!”, you are not alone. In a recent independent study conducted by Enterprise Systems Media, more than 50% of respondents acknowledged that they do not have a single, consistent multi-platform solution that provides information to managers, internal buyers, or end-users about performance and capacity across their enterprise. Additionally, close to 30% responded that they did not know if this capability even exists within their organizations. Watch this webinar featuring Enterprise Systems Media’s Denny Yost and ASG’s Gary Henderson to learn how your organization compares. Today’s business demands are fueling application growth and increases in computing capacity at record rates. One of IT’s primary objectives must be to allow for business growth while controlling costs and capacity. Understanding how existing MIPS capacity is being utilized and where you can make adjustments is key! Watch this 30-minute demo to find out how ASG-TMON Performance Analyzer can help you manage MLC and prevent unnecessary MIPS upgrades by effectively using GPU and lower cost zIIP processor resources. According to Bob Dylan, “The times they are a-changin’.” In the field of data management today, this means a number of exciting but challenging developments. Data itself is evolving into larger volumes from new sources in a broadening array of structures, containers, interfaces, and latencies. New data-driven business use cases are rising in prominence, especially those for analytics, self-service, and agile operations. In response to user demands, the software vendor and open source communities are supplying many new data platforms, tools, and capabilities—all purpose-built for modern data and its use cases. This webinar is a “must see” for technical users and business managers who are facing these changes. The expert panel on this webinar will help you understand what’s ahead in 2019 and beyond for data management. Attendees can then apply that information to prioritize the data management changes they must address and how they will prepare via hiring, training, budgeting, making a business case, and adopting the right data platforms and tools. The webinar panel, moderated by Philip Russom, TDWI’s lead analyst for data management, brings together a number of experts including Sue Habas, VP, Strategic Technologies at ASG Technologies. - New data platforms, such as Hadoop, clouds, object store, and databases based on columns, NoSQL, graph, etc. IT must ensure that capacity meets current and future business requirements in a cost-effective manner, but it takes more than just monitoring your infrastructure for current problems. It’s about preventing issues tomorrow, through proper planning and implementation today. Watch this 30 minute demo to find out how ASG-TMON Performance Analyzer can help you move beyond reaction to prevention. The advances in technology and the growth of information are dramatically changing the landscape – constantly & expeditiously. ASG’s Mobius Content Services Platform (CSP) enables your organization to establish a digital automation foundation on which to transform your business. In this session, learn how ASG and its Mobius CSP delivers the technology to help you and your company thrive in the rapidly changing information management environment, prepare for the emerging digital automation economy and use Mobius to bring people, process and information together at digital speeds with web scaling. In the digital era, an organization’s business strategy is inextricably linked to its data strategy. Yet increases in data volume, variety and velocity continue to challenge data management strategies and capabilities making it difficult for enterprises to effectively satisfy defensive (run the business) and offensive (drive the business) needs. In this session, we explore the state of data management including key trends and their impact on the direction and evolution of ASG’s Data Intelligence offering. Over the past few years, about 90% of data management has been dedicated to the operational requirements of data governance and regulatory compliance, but this is changing rapidly as financial institutions look to exploit and drive business value from data. At a growing number of institutions, close to 70% of data management resource is focused on understanding data and implementing analytics that help the business work faster, smarter and identify new opportunities. How can you shift the balance between operations and business analytics safely and successfully, and ensure investment in data management initiatives delivers proportionate business value? Modern content services and flexible platforms have won the generational war over traditional monolithic suites. A third of enterprises are leveraging newer, modern content platforms … is your organization one of them? Watch this webinar hosted by ASG, and featuring guest speaker Cheryl McKinnon, Principal Analyst at Forrester Research, to learn about the top trends shaping the ECM market and benchmark your own program against industry peers. Businesses today demand agility, integrations and interoperability. Documents contain data that is hard to mine for insights in older suites – thus analytics increasingly drives content management roadmaps. Hear how companies like yours are addressing new use cases for content management and delivery. Don’t miss this opportunity to find out how you can accelerate your digital transformation with modern content services. “Digital Transformation” may be an over-used phrase, however, its objectives and value remain strong. To survive and thrive in an information-driven economy, enterprises must leverage digital means of connecting with their employees, customers and partners. Information is fundamental as it drives processes, enables insight and is increasingly a product in itself. In this webinar, we explore the state of digital transformation and how enabling information plays a core role in transforming companies in the information economy. Successful onboarding is NOT just a matter of completing paperwork, selecting benefits, and getting a tour of the office. Getting your workforce up and running quickly and effectively will accelerate productivity. With digital workspaces, IT and HR can partner to ensure every new employee hits the ground running on Day 1. • Support any device, anywhere – so you can engage the best talent regardless of location. • Embed IT policies regarding security, governance, and regulatory compliance. • Are tailored to an employee’s role, but support personalization to suit individual work styles. • Offer a single point of control to facilitate a secure offboarding process. Wondering how to maximize your workforce’s productivity? It all starts with their first day and your company’s onboarding process. Effective onboarding can mean 50% greater new-hire productivity, and with talent acquisition costs at 1/3 an employee’s compensation that’s a fact that can’t be ignored. Yet, many organizations struggle to develop a cost-effective and streamlined approach to technology enablement, though it’s critical to their onboarding efforts. ASG Technologies is an award-winning, industry-recognized and analyst-verified global software company providing the only integrated platform and flexible end-to-end solution for the information-powered enterprise. ASG’s Information Management solutions capture, manage, govern and enable companies to understand and support all types of information assets (structured and unstructured) and stay compliant. ASG’s IT Systems Management solutions ensure that the systems and infrastructure supporting that information lifecycle are always available and performing as expected. ASG has over 3,500 customers worldwide in top vertical markets including Financial Services, Healthcare, Insurance and Government. Visit us at www.asg.com.